On the last day of the World Social Forum in Nairobi, Kenya in January 2007, I took a walk around the grounds to visit organizations that looked interesting. One booth that caught my attention was that of the Kenya Land Alliance. They had a poster and brochure that talked about three categories of land: private, community, and public and called for fair distribution of land among the people of Kenya. Id only been in Kenya about a week and was just beginning to learn about unfair dealings by both foreign interests and the domestic government. So I was curious to learn more about land issues. I was also curious about their categorization of land. From my own American experience, Im familiar with the concepts of private and public land, as well as the condominium. The idea of community land sounded a lot like public land. How is it different, I wondered. The KLA brochure offered a definition and some information about its characteristics and management. In the booth, I also met a woman, Catherine Kimunya, representing another group called the Ogiek Welfare Council (OWC). She was selling a book called Ogiek Land Cases and Historical Injustices, which, upon thumbing through it, I found intriguing. I asked if the book was available online. She said no, but they would like to do that. I asked if they needed help to do that and she said yes. I talked with her about going to visit her group, which was in Nakuru, a city not too far from Nairobi, to discuss doing that. Towards the end of my conversation with Catherine, I noticed she was wearing a T-shirt that said, We hunter-gatherers face extinction! ! I asked her about it and she told me the Ogiek people are historically hunter-gatherers and some of them still do live that way. This certainly captured my imagination and I wondering if I might get a chance to meet some. About a week later, I traveled with a new friend, Kioko Kitusa, to Nakuru to meet with the Ogiek people and learn about their land disputes. Kioko was a young man from a village Id had the opportunity to visit a few days before the Social Forum. Hed taken me for a hike in the mountains, where he gave me a lesson on the African history Id never learned in school, such as about the 1895 meeting in which European countries divided up the African continent amongst themselves like so many trading stamps. He was a recent high school graduate who stood at the top his class but could not afford to go to university. I had agreed to the request of one his village neighbors to see if I could help him go to university in the US, and Id been helping him look into SAT tests and scholarship applications. 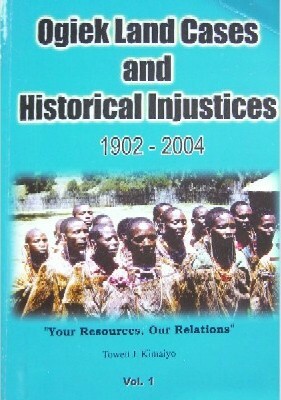 But most of our conversations had focused on issues of political and economic oppression in Africa. I was hoping that on this trip he could help me overcome some inevitable cultural barriers I would encounter, and that in return he could have an opportunity to broaden his experience of his own country. 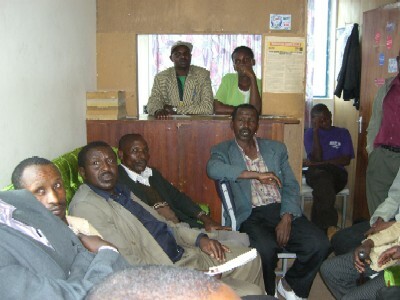 We had been invited to visit on a day that the OWC was having a meeting, so we got to see a number of people. They did their best to conduct the meeting in English for my benefit, but this didnt really work so I didnt understand most of what was talked about. Afterwards though, I arranged to talk with a couple of groups that wanted to explain their specific grievances to me. I carefully explained to them that I was nobody of any stature or power, but said I would describe what I learn about their circumstances on a website and maybe that could draw some attention that might be of some help. I took some notes in those meetings after the meeting and got copies of some documents, but my head was spinning. Here was an entire ethnic community spread across a vast territory of a country Id never been to before, turning to me with complaints of legal abuses at the hands of their own government. What in the world was I supposed to do with this information? If there is any merit to these complaints, then surely the matter warrants an investigative team in their own Department of Justice or some office of the United Nations. But that was the whole point. Thats what they mean when they describe themselves as marginalized. Nobody is paying attention to their complaints, least of all the very government they accuse of pushing them off their land. The first of the after-meetings had about five men in it. They told me stories of soldiers coming to evict them from their homes. They showed me title deeds, land allocation cards, a photocopied book called the Register of Households. Finally, since I didnt know what to do with the variety of cases they were telling me about, I asked them if there was one case that is their strongest, so I could focus on that. They talked with each other for a while and soon agreed on one. This was a case of two men, Joseph Singoe and Kimutai Korir, who had 5-acre homesteads next to each other, which had both been grabbed by a man they say is an attorney who works for the government. Wow, talk about being at a disadvantage! If your opponent both is a lawyer and works for the same government that your complaint is with, youve got a lot going against you. They gave me a small stack of documents related to the case, including a title deed and some court papers. I asked if I could go to visit this land in the next few days and they were eager for me to do that. The land is in an area called Tinet, which is a drive of a couple of hours away. 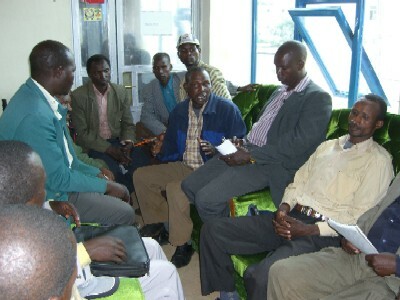 We had originally gone to Nakuru to discuss helping them put Towetts book on the Internet. I told them what I needed to do that was a computer file with the text of the book. If that was not available, then someone would have to either type the book into a computer or scan the book and correct the errors of optical character recognition, either of which would be a big job that I was not offering to do. If they had, or would make, a file of the text, I would convert it to a website. Catherine and Towett seemed to think that the book did exist on a computer, either theirs or in the office of a university professor they work with, but they werent sure. Although I saw a computer in the office, I understood that these people do not live by it the way I do mine. We made arrangements to return the next day and Catherine would look more into finding the file for the book. As luck would have it, there was no power in the office the next day, something that happened not infrequently at various times on my trip. Thinking about what to do, we eventually found out that a cyber cafe on a lower floor of the building had power and we got permission to take the OWCs computer down there to plug in. Catherine believed the file was on there, but wasnt sure where to look for it. I snooped around in the file structure and found a number of files that seemed to contain various versions of the book. This kind of version multiplicity is a common problem, especially among less experienced computer users. Since Towett was not in the office that day, I had no one to tell me which version to trust, so I wanted either the latest and most complete version or else one that was identical to the printed book. I did some automatic text comparison on a number of files and finally narrowed my choice down to two files, which I copied to my computer to work with later. From those two files, I picked the one that looked closest to the actual book as printed. Then I went to work on converting the text of that file into the primary content of this website. As mentioned above, Joseph Singoe and Kimutai Korir had 5-acre homesteads next to each other, which they claim were grabbed by an attorney who works for the Kenya government. The documents they gave me about the case included a copy of a title deed in the name of Kipkoech A. Langat, who is the state attorney they were talking about. The next document in the stack was the report of a Land Disputes Tribunal in the matter of the two parcels of land. There were five pages of testimony of various people, some of it contradictory. Langat claims to have bought the land from a John Maritim and to have confirmed verbally with other people that Maritim did own land in that area. There was mention of a survey being done. There was nothing about how the title deed had been procured and nothing about Maritim producing a title deed to establish his ownership and right to sell. After the testimony, there was a page that summarized the findings of the tribunal and then a decision. The decision was that Langat should transfer the deed over to Singoe and Korir, vacate the land, and pay for some expenses. The next several documents were related to a court filing by Langat claiming that the tribunal has no jurisdiction in this matter and asking that its decision be overturned. The last document was a court decision ruling in Langats favor. I think Ive got an idea of whats going on here. And this case seems similar to several of the others people told me about. 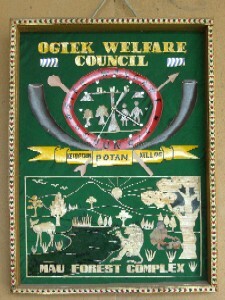 In the 1990s, Ogiek families were allocated particular parcels of land and each head of household was given a card indicating the parcel that was theirs. It seems strange that people were given allocation cards instead of title deeds. After a while, other people started showing up with title deeds for the same land represented by some of these allocation cards. This seems to be what happened with Singoe and Korir. Nobody told me where these title deeds are supposed to have come from, but a deed is considered stronger proof of ownership than an allocation card. Clearly, something very wrong has happened here. Who was the idiot that decided to give the Ogiek people allocation cards for their land instead of deeds? And where are the government records of what parcels were allocated to whom, so that deeds could not be legally issued against the same properties? It is conceivable that this problem could have been created by incompetence, by the responsibility for parceling out the Ogiek land being handled by someone who didnt have the proper experience to know how to manage and record the transactions. But the system used is so sloppy that one does wonder if the whole thing was handled in such a way as to purposely swindle the Ogiek by convincing them they were being given allocations of land, when in fact the paperwork they were granted for it was worthless. Im certainly not capable of rendering anything vaguely approaching a legal opinion on this matter, but it does look awfully suspicious. It would seem that at the very least, the Kenyan government ought to be willing to investigate how this mess got created. Unless the Kenyan government already knows how it got created because it created it either through its own incompetence or through its own fraud. Two days after the OWC meeting, I rented a car and went with Kioko to Tinet, where the Singoe and Korir land is located. I got to experience Kenyas roads as the driver for once, which I found out is hard work. For most of the way, the pavement was so broken up with potholes, that I had to constantly watch out and maneuver around them. Because of this there is no expectation that a vehicle stay on its side of the street. Its perfectly okay to drive on the wrong side, even clear over on the other shoulder, if thats necessary to avoid the potholes. This, of course, makes the drive that much more harrowing because when the road curves, I could never know when I was going to find a vehicle coming at me in my lane of traffic. We finally found ourselves in the little town of Tinet, where David Sitienei, one of the men from the meeting, recognized us and flagged us down. He got in the car and we drove to his house, which was a couple of kilometers off the paved road. Since rain was expected and the dirt road could become impassable, Kioko took the car back to the road and waited with it there while I went for a walk in the forest with David to see the land in question. 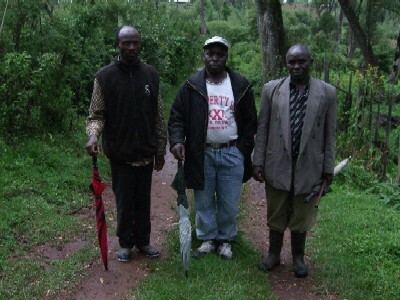 We walked for maybe a kilometer or two and finally came upon two men whom David introduced to me as Singoe and Korir. They were waiting for us next to the land they say should be theirs. 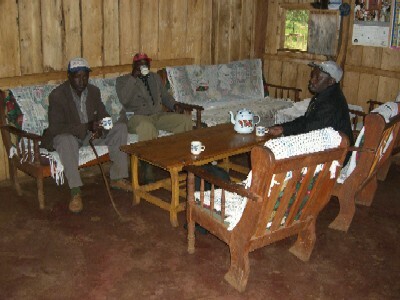 Korir showed me the charred remains of what used to be his house, which the new occupants of the land had burned down. Then he showed me a small storage building, which he said he had built, which was still standing and presumably in use. We walked along the trail next to the land and soon came to the boundary between Korirs and Singoes land. A fence was still up separating the two. Walking alongside Singoes land now, we soon saw a cluster of small buildings at one edge of the property, which are the house and barn and some other work buildings. We saw some people looking at us from the buildings and the men told me they are workmen. Langat doesnt come around here very often, but employs other men to work it for him. I asked Singoe and Korir where they live now. They both answered that they and their families are staying with relatives. They have nowhere else to go and I suppose they are lucky to have relatives who can take them in with their wives and children. 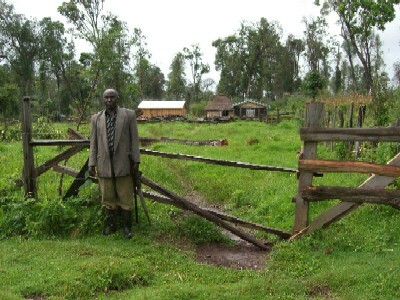 Left: Joseph Singoe standing in front of the Mau Forest homestead he claims was grabbed by a Kenya government attorney. 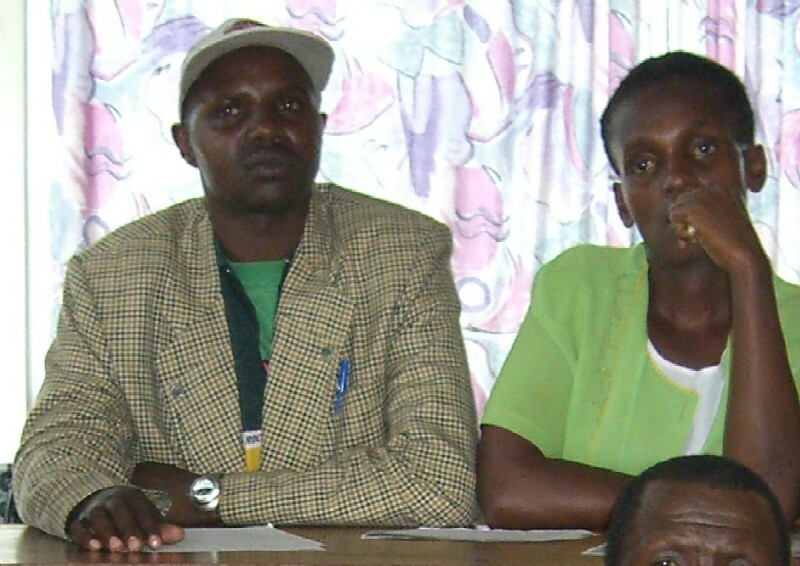 Right: Kimutai Korir, David Sitienei, and Joseph Singoe. 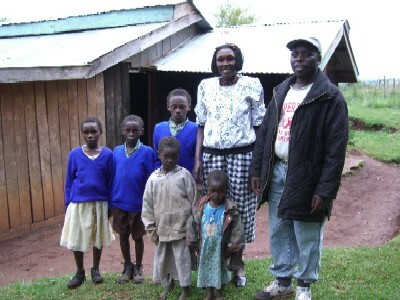 Korir is Singoes former next-door neighbor who also claims his land was stolen by the same man. Sitienei took me for a walk in the forest to meet these men at the land they claim is theirs. I took pictures of the property and of the men. I knew they were expecting me to do something to help them. I knew they did not know what it was that I could do but from my experience here I would say that because Im white they figure I have money or influence or both and can get things taken care of for them. This was not a promising situation since I had no more idea than they did what I could do to help. I told them that Id be interested in meeting Langat to ask him questions about the land. 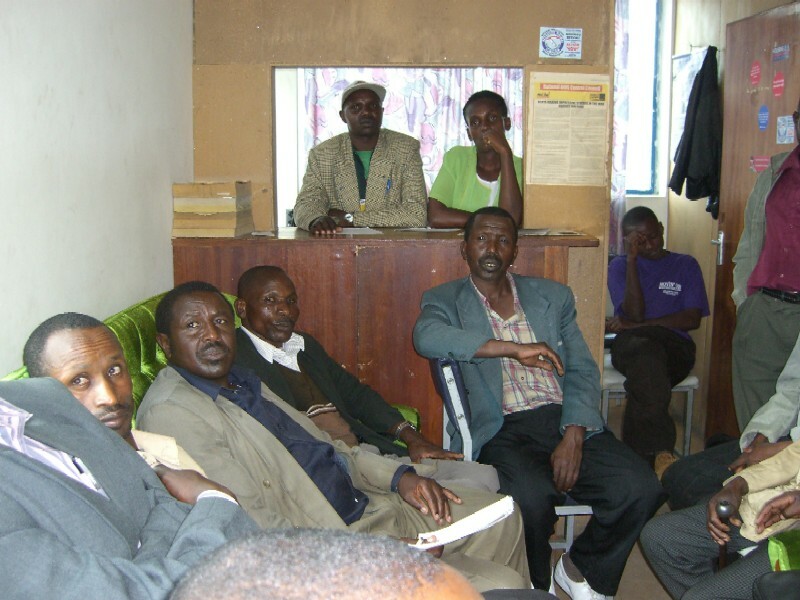 They said he works in Nakuru and that could be arranged. However, Kioko and I left the area the next day and I did not get back to Nakuru on this trip. It could have been an interesting meeting. I encourage anyone else to go visit Langat with the questions I would have liked to ask him. For example, Id like to know if Mr. Maritim had a deed to the property when he sold it to Langat. If so, does Langat have that deed now, or at least a copy of it? If Maritim did not have a deed, then on what authority was a new deed issued for this property? That ought to be a good start for an interesting conversation. As a lawyer, Langat ought to know the answers to such questions. I unwittingly took on a heady responsibility when I asked the Ogiek men at the meeting to tell me about their land disputes  far more responsibility than I was capable of handling. Although I told them I had no power to do anything myself, I dont know if it was my enthusiasm for their cause or just their desperation, but something told them I was going to battle for them. For the next several weeks, I got occasional phone calls from individual members of the group, asking about my work on their cases or if I was coming back to investigate their particular community. I got a terrible feeling that I had given these people false hope of what I could do for them. A few weeks after the trip to Nakuru and Tinet, I got a call from someone I did not understand, something that happens occasionally here. Fortunately, Kioko was visiting with me at the time and I handed the phone to him. He said it was someone calling from the Ogiek, saying that some people were being evicted from their land at that moment. It seems they wanted us to go there and witness it happening. That would have been an incredible journalistic opportunity. 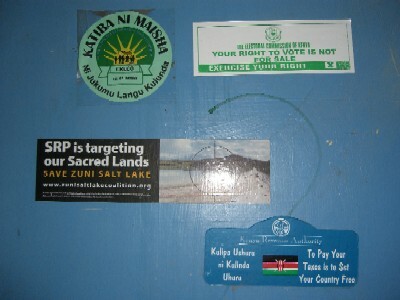 However, I was resisting the temptation to turn my brief visit to Kenya into a major investigative project. But again I felt sad, wishing I could do something to earn the faith these people had put in me. I feel good that I have been able to put this website together for them. I hope it will attract some useful attention to their issues. I knew when I first saw Towetts book that it was something that needed to be online. Now, let the Internet do its magic and create fruitful connections among people who never knew each other existed before!  2009 06 12 F: Moved site from GeoCities to another free Web hosting service, Tripod, since GeoCities service is shutting down.  Who Owns Kenya?  What is the Queen Doing in Parliament? The first item is a page within my personal website. The others have been set up in Tripod, instead of in my site, in order to give examples of what can be done with a low-tech site that can be created for free, as explained in the last site listed. This page copyright © 2007, Marshall Burns. All rights reserved.